Full Sail's Session Lager is a lesson in a (stubby) bottle. No brewery suffered the downturn in the mid-90s more than Full Sail, which had just expanded to a 250,000-barrel brewery. They expected to grow from the 80,000 barrels they were brewing, but instead shrank 25%. There followed a series of label redesigns (they've had four in all) as the brewery cast about, trying to find its identity. "He was a little embarrassed, but he finally told us that he didn't like craft beers, that they were too big, too bitter, too heavy," she said. 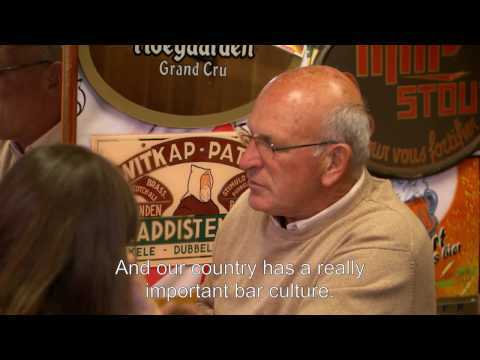 "We realized that there are people who want to drink a Heineken, or a Corona or a Beck's. You're not going to get them to drink an ale, so we decided to make a beer that would appeal to them." It's a good strategy: instead of bemoaning the fact that imports cut into the market for craft beers, Full Sail created a beer -- and a brand -- for the import lager drinkers. The label bears only the small initials FS with a tiny 47 underneath -- the number of employees in this employee-owned brewery. 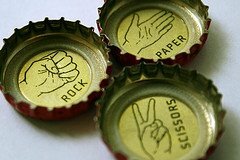 Given that Pabst is a purely market-driven phenomenon (don't believe me?--do a blind tasting and see if you can distinguish it from other national macropilsners), packaging a beer to appeal to the highbrow-averse was a stroke of brilliance. Stubbies died out when the last of the regionals were snapped up, and now the only odd-sized bottles are in collections. Session has the distinction of being totally retro and ultramodern simultaneously. I don't actually know how Session is selling, but whenever I go to the store and watch someone pick up a half rack, it's someone who looks like he was trying to decide between Pabst and Session. And I've seen a lot of those guys. But marketing aside, what's it taste like? Sessions, as you know, are designed to be drunk in a "session" of drinking. It's a category of beer, rather than a style. Sessions should be low in alcohol and not overly aggressive of palate. FS Session is actually revolutionary in more ways than just the palate. True, it looks like a standard macropilsner when you pour it out (should you ever pour it out, which is unlikely)--pale (not as pale as Bud, but pale) and effervescent. The brewery plays along with the ruse, citing pre-prohibition pilsners as inspiration (in order to recall in the drinkers mind, perhaps, Henry Weinhard's?). But the palate is clearly borrowing a lot more from pale ales than pilsners. The hops ("American") have a note of sweet citrus and imply Cascades. You'll find esters in the palate as well--or psuedo esters, anyway. In short, it's a tin-can beer for people who like pale ales. I don't know why no one else thought of it first. As a stand-alone beer, good. Compared to any beer that has ever appeared in a stubby bottle, a classic. ...No matter how alluring it appears on the shelf. Just about ready to sit down and do a review of Czechvar--at long last--and I discovered I'd gotten a bad bottle. Not skunked, but flatish, gassy, and soapy. I've had many an original Bud (this is the beer Adolphus ripped off for St. Louis' signature beer), and they were lusciously rich, subtle, and smooth. So the official review will have to wait. Like restaurants, brewpubs have personalities. They may be temples to brewing, with gleaming kettles and fermenters looming behind the bar, or they may be modeled after an English pub, with dark wood and darts, or they may have an original feel created by the owner. 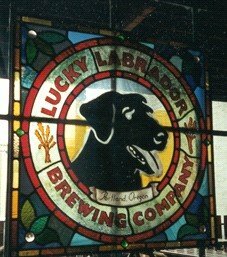 If you wanted to describe the Lucky Labrador Brewpub’s personality, “authentic” wouldn’t be a bad choice. Like an old flannel shirt, Lucky Lab is comfortable and unaffected. 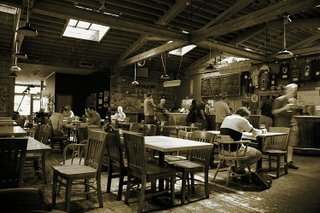 The best brewpubs reflect the character of their neighborhood, and the Lucky Lab is situated at the edge of one of Portland’s most down to earth, the Eastside Industrial District. 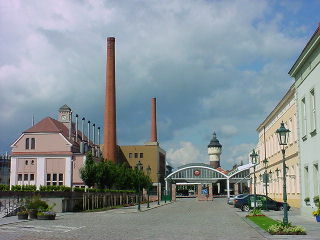 An active pocket of light-industrial business, this is a part of town where people come to put in a good day’s work. One of the most popular coffeehouses isn’t a Starbucks, but My Father’s Place, an old-style diner where you can still smoke and get a plate of biscuits and gravy for breakfast. It is possible to enter the pub from the Hawthorne Street side, but that entrance, which sends you down a long, deserted hallway, feels like the back way. Rather, most people head to the north entrance where there’s a covered back patio and picnic tables—seemingly populated even in winter by groups of chatting pubgoers. From the back door, you are delivered right into the hubbub of the main seating area. Although the building is a mostly unaltered warehouse, it doesn’t feel industrial inside. The floor, ceiling, and thirty-foot bar running along the wall are all wood. Light drifts down from the high canopy onto a dense scatter of tables, also wood. Inspired by English pubs, the atmosphere is warm and inviting, if not exactly English. On the wall near the restrooms you can find a bulletin board covered with snapshots of patrons' dogs—mostly labs of every stripe. And near the rear door is a similar collage, this one showing the brewery’s faithful on vacation, standing in front of famous monuments while proudly displaying a Lucky Lab T-shirt (my favorite is “the grassy knoll”). The patio outside is home to another group of regulars—the four legged variety. Particularly in the summer, the one often finds as many dogs as their human companions. The food tends toward the basic side, with soup, sandwiches, and bento. During one tour, Geist noted, "This is our kitchen—it’s a hallway—which I guess shows our emphasis on beer." In fact, though the menu is limited, the food is excellent. Featured are a wide selection of vegetarian options as well as particularly meaty choices like a stout-cooked sausage sandwich. Portland natives Alex Stiles and Gary Geist founded the Lucky Lab in 1994. 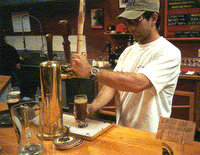 The idea for a brewpub first came to Geist and Stiles in 1991, when they visited Europe on a post-college backpacking adventure. Enjoying the pub culture throughout their travels, it was at the magnificent brewing monastery Kloster Andechs in Germany that, as Geist punned, they were “almost divinely inspired” to own their own brewpub. After returning to Portland, the two worked at BridgePort, Geist in the pub pulling pints, Stiles in the brewery, and the inspiration grew into a business plan. In the early summer of 1994, with $190,000 raised from ten investors, they leased the 1922 warehouse on Hawthorne and set to work converting it. They did most of the work themselves, from making their own bar to dismantling an unnecessary chimney brick-by-brick to creating and insulating a walk-in refrigerator (“we’ll never do that again”). Initially, Stiles and Geist had planned to lease the building, but the opportunity to buy it arose, and they took out a Small Business Association loan and bought the old warehouse outright. They outfitted the new brewery with a mash tun and kettle, as well as some grundies from Cross Brewing Equipment, and by fall were ready to brew. In all, the process took 3 ½ months and, even doing most of the work themselves, they finished without a dime left over. The Lucky Lab was a success from the start. Locals were immediately supportive and it remains a model for a neighborhood pub. In the years since it opened, the Lucky Lab has become one of Oregon’s largest brewpubs, brewing around 1,200 barrels of beer each year. Along with the McMenamins and BridgePort, where Geist and Stiles once worked, the Lucky Lab has become one of Portland’s signature brewpubs. Once a month Stiles, Geist, and assistant brewer Dave Fleming sit down with several classic examples of a style of beer for research and development. They’ve tasted everything from abbey ales to Bavarian weizens to Irish stouts. You’d never know it from their beers, though, which all bear the same distinct flavor profile. Most obviously, the Lucky Lab beers are hoppy. Even those without a lot of bitterness have layered hop character, starting with the nose and lingering after each sip. Hawthorne’s Best Bitter, the brewery’s best-selling beer, is a good example. With a mere 26 BUs, it is nevertheless densely citrusy from liberal Cascade hopping. More subtly, the beers all have a hard-water quality reminiscent of the beers produced by the famous waters of Burton-upon-Trent (though Lucky Lab beers are brewed with gentle Portland city water). Most of the Lucky Lab beers are aggressive, which suits the taste of Portlanders, who like their beers to have intense flavors. Dog Day IPA is an exceptional example of an India Pale Ale, a notoriously strong, hoppy style. On the other end of the spectrum, Black Lab Stout is so impenetrable with dark malts that, unless it’s been cask-conditioned, it is likely to overwhelm most drinkers. For a milder beer, try Stumptown Porter or Königs Kölsch. PHOTO: Kyle G. Grieser. Post updated 6/26/06. Testing some coding here. Imagine I was writing a post and I wanted people to know how big a barrel of beer is. Could I use this handy feature? Apparently so. bitter (n) - An English term for a well-hopped ale, most often on draught. Although examples vary widely, the name implies a depth of hop bitterness. There is usually some acidity in the finish and colour vanes from bronze to deep copper. By "depth of hop bitterness" one should not read "bitter," which is rather confusing, given that hops are bitter and the name of the beer is bitter. Bitters (noun) are, nevertheless, not particularly bitter (adjective). They are, in fact, the first in a triumverate stretching through best bitter and terminating and extra special bitter (ESB). 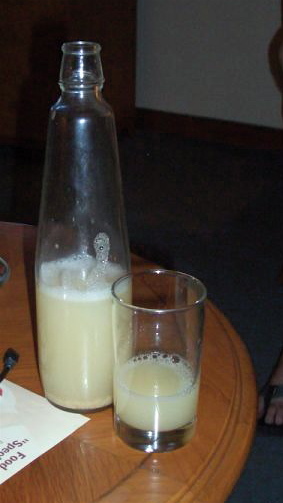 Bitters are the sessions of the bunch, weighing in at 3.5 - 4% abv. Best bitters are stronger 4-5% abv, and ESBs positively robust at up to 6% abv. So a traditional bitter will have a layered hop profile, with lots of aroma and flavor to go along with noticeable (if not agressive) bittering. A good bitter is hard to make, and one of the best was Bachelor Bitter, Deschutes' first (and still available at the brewery). It morphed into the less interesting and bottled Bachelor ESB (which is probably confusing at the brewery), and for years Deschutes has offered no bottled bitters for those of us on the west side of the Cascades. Until Twilight. As for the palate--well, Twilight is an impressive follow-up to Bachelor Bitter. They have hedged their bets, giving it a bit more oomph than is strictly legal for the style. Yet even at 5% it has impressive creaminess. The brewery employs four hops (only the Amarillos are identified), and the flavor is layered right through the aftertaste, as the volatile dry-hopped aromas waft around your mouth. Although clearly a session, it has the gravitas of a larger beer. The image of a well-engineered 4-cylinder car came to mind--small engine, big performance. Deschutes has the knack of creating exceptional beers that wow drinkers without overwhelming them. The kind of beer you hold up, halfway through your third, and remark, "Damn, that's really a good beer." I imagine that if you took a half rack to a party, everyone would congratulate you on your good taste. Consider it a recommendation. Hops:Three unknown varieties and Amarillo dry hopping. Sorry about the incredible lack of content on Beervana. I actually have three reviews ready to post (Deschutes Twilight, the new Lucky Lab pub, Czechvar), but I've been both swamped and plagued by a bum DSL line. I expect activity to pick up and reach a robust clip this week. Among beer afficianados, no story is more familiar than pilsner's (except in Oregon, possibly, where IPAs are king): in 1842, a newly-founded brewery in Plzen, Bohemia shattered convention by introducing a clarion gold beer. Until its release, all beers had been dark and murky, suitable for serving in ceramic steins. The new, straw-colored beer captured the imagination of beer drinkers with its bright clarit, spread across the globe like a virus, and now is produced in nearly every country on the planet. 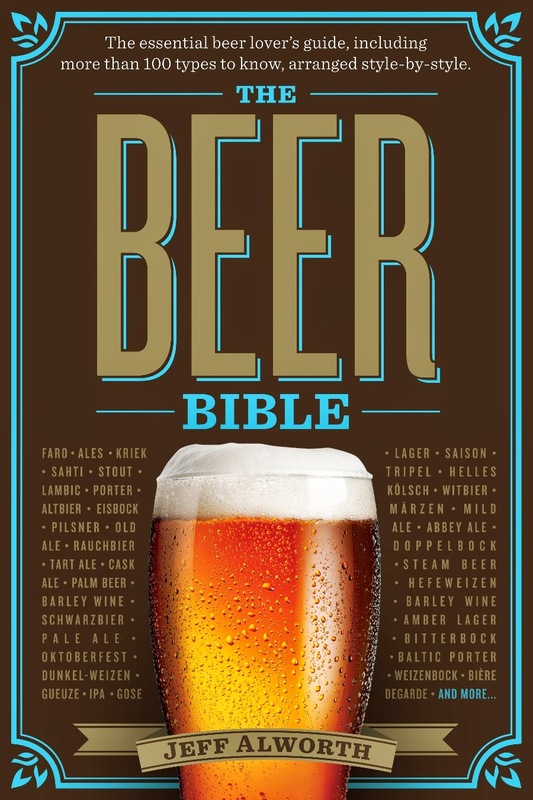 It is one of the most popular products in world history, and certainly the most popular beer. 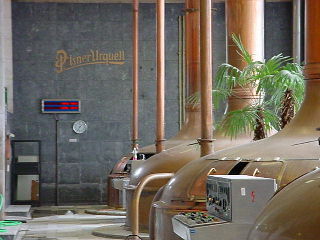 That newly-founded brewery was Pilsner Urquell--literally "the original beer from Pilsen." Due to their ubiquity, pilsners have some backsliding in quality. Beers like Singha, Kingfisher, Panama, and Pabst may be interesting national variants, but they don't really match the original, which is one of the few pilsners still widely available across the world--and rightly so. It's also a very nice beer to crack on a sunny afternoon. I can't speak to that beverage--I have only tasted the beers available to American mortals, which is absurdly shipped in a green bottle, an aid the forces of degradation. Still, when handled gently, it is nevertheless an extraordinary beer. As beautiful today as in 1842, it bursts with the pepper of Saaz hops and Bohemian yeast--an aroma unique in the beer world, and one of the most familiar. The palate is simultaneously soft and dry, effervescent and--in a surprise to people who think Budweiser is a pilsner--intensely hoppy. The beer is triple-decocted, which may be one reason it's so gentle (though the decoction debate is an ancient and hotly-contested one). In much the way that alder-smoked beer remind people of salmon, Saaz hops give pilsners their "pilsner" flavor--that earthy, spicy, peppery quality that typifies the style. Pilsner Urquell is the most aggressively hoppy of any exported Czech pilsner, and if you're looking for a study in the hop style, go no further. Plzen water is reported to be very soft, but I detect a slight quality of mineral in the beer--perhaps from the effervescent carbonation. A wonderful beer. Fal Allen is one of the old-time brewers from Seattle, having turned in stints at RedHook and Pike. He is currently the brewmaster of Archipelago Brewing (a division of Asia Pacific Breweries) in Singapore. And he has a blog. All of this would be interesting enough on its own, but add to it this: in his wanderings, he discovered a locally-produced Indonesian coconut beer called tuak. As the lane turned onto a wider road a small gathering of people called me over to a house, where on the front porch area they were sitting around drinking out of these unusual looking bottles. As I got a little closer I could see that the bottles obviously contained a fermented beverage of some kind that I was not familiar with. I was offered a seat and the chance to buy a bottle. My first thought was - well, look it's still fermenting in the bottle - those guys are drinking it and they are not dead (yet) or comatose (yet), so sure why not, what could happen? (As he managed to complete the post, I think he must have survived.) The entire tale is fascinating, so go read the rest. Admission to the festival is $4 which includes a mug, tickets for 4 ounce samples of beer will be $1. Attendees get $1 off admission with three cans of food for the Oregon Food Bank, a validated MAX ticket, or a World Forestry Center ticket. The Forestry Center will offer a $1 discount for festival attendees. Nineteen breweries (including three international) are bringing thirty beers. Craig always does things right, so I expect it to be a rockin' good time. Go forth and bring back news. Ah, summer, that time when I really don't want to drink beer. It's too hot, the beer dehydrates and goes to my head. I guess, like my fellow webfeet, beer is a beverage for a cold day and a warm pub. (Maybe that's why local breweries often just skip summer seasonals.) But then again, summer is long, far too long to go without a beer. So, since we must slake our thirsts with something, I bought a few examples of summer seasonals (okay, two are classic Czech pilsners, but to me that's a summer seasonal) and I'll review 'em this week. First up, Alaskan Summer Ale. Much as you will not find American made “Belgian Ale,” you will only find Kölsch-style ales; the city of Cologne made sure of this by enshrining Kölsch’s status in the German legal code in 1985 (one of the definitions was a strict limitation about where the beer is brewed). The style is one of the few German ales, but the flavor palate, like altbiers, is drier and less fruity than other ales. For an obscure style, Kölsches are more popular in the NW than you'd imagine. Widmer has experimented with the style, and the McMenamins' regular summer ale is a Kölsch. In fact, there seem to be more examples of Oregon-brewed Kölsches than pilsners--perhaps the only place outside Cologne where that's true. Alaskan Summer Ale is a rather rich hue of gold--substantially darker than the pilsners to which Kölsh is often compared. The head dissipated quickly, but the beer roiled with a vigorous fine bead. I don’t doubt that there’s an aroma to Summer Ale, but next to none from the bottle I poured (maybe the slightest note of yeasty tartness). Kölsches, despite the paucity of ingredients, can pack a complex punch--the good ones, anyway. Alaskan's is a nice example. The first note is subtly sweet and tart, but it finishes with a dry note. Alaskan underhops their version, but it's not a mistake; the more subdued flavors come to the fore. The brewery uses its regular yeast, which is a drier version more akin to the yeasts of Germany (and atypical for West-coast beers)--a great fit for Summer Ale. All in all, a beer fit for Cologne. On a hot summer day, you might have a bottle or two and not regret it. A cooler summer eve? Even better.